What’s most important is that you begin a dialog of understanding and acceptance of your child’s differences early. If you don’t lay the foundation for your child’s positive awareness of his or her differences, you leave room for others to fill the gap with undesirable and potentially damaging images. Over the years, my son, Dylan’s perception of himself as an academic achiever had been severely bruised and self-doubt had begun to play a larger role than we desired in how he was responding to school and in social settings. I recognized that I needed to try to help him to counter any negative feelings he was being conditioned to believe about himself. I knew that he was smart, but he needed a way to conceptualize why he struggled with some topics at school but did well with others. He was beginning to think that something was wrong with his brain, so I decided that I needed to show him what was right with it. 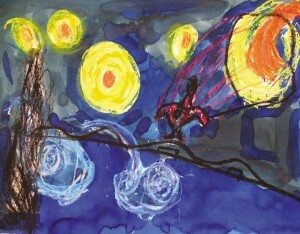 As we recognized Dylan’s artistic strengths, everything began to make sense. While he demonstrated weaknesses in some skill areas; he conversely demonstrated superior skills at others. His brain must have been balancing his abilities, fueling his strengths and forcing him to work harder to achieve success in his weaker cognitive areas. I simplified the “balance of strengths and weaknesses” concept and presented it to him the way he understood best: with pictures. My explanation was not clinical, and I’ve learned so much more about how the brain works since I explained it to him over fifteen years ago. But my elementary approach to the topic, using this simple illustrated explanation (see figures 1 and 2), worked for us when my children were younger, and has surely helped Dylan and many others to appreciate his differences and become more comfortable with his differentcy. Figure 1. This is how I imagined Dylan’s attentive brainpower might be distributed—big “parts” or capabilities for art, details, and perceptual reasoning, and small parts for reading, writing, language, and math which was becoming more and more dependent upon his ability to read effectively. Figure 2. This is how I imagined a “normal” child’s attentive brainpower might be distributed—equal “parts” for everything, with a sprinkling of other talents, as well. Of course every child’s brain would be different but, this is the model I used to make the point. With these images as my illustrations, I explained to him that just like all people look and act differently, their brains work differently as well. An individual might have any combination of big and small parts that represent his or her skills. Our differences are what give us, each, our unique combination of strengths and weaknesses. Our differences are what make some folks more inclined to do one thing with ease and maybe struggle with something else. Our differences are what make some folks inclined to like strawberry ice cream and others to prefer butter pecan. There’s nothing wrong with being different; a person’s differences are what make him or her unique. To help Dylan accept and become more comfortable with the person he was, I explained that everyone didn’t understand and accept the concepts of individual differences. I shared that the school system often favored treating everyone like their brains all work the same way. For the most part, “normal” people’s brains do work in similar ways, but extraordinary people’s brains work differently. Over time, I fine-tuned our conversation to describe the specifics of Dylan’s particular differences. When explaining his differentcy to him, I was always careful to point out his strengths as they balanced and sometimes outweighed his challenges. I was surprised to see how quickly he could shift his behavior as he learned to understand his differences, compensate for whatever his current short comings were, and begin to take measures to overcome and work around obstacles with clear goals for success. If I had to do it over with all the new information I’ve gathered over these past years about how neurodiversity works, I might have explained the concept with images of tunnels and connections in the brain. Those images would demonstrate how information might flow through those tunnels to some areas of the brain, connection for comprehension or action, while others might be blocked or detoured to a longer route causing delays or missed delivery of information for processing. You can use your own creativity in devising and delivering an explanation suited for your child’s differences and what will work best for your child’s own ability to understand and conceptualize the ideas. What’s most important is that you begin a dialog of understanding and acceptance of your child’s differences early. If you don’t lay the foundation for your child’s positive awareness of his or her differences, you leave room for others to fill the gap with undesirable and potentially damaging images. You have the ability to manage the reflection your child sees in the mirror. Make it a positive one. Pamela Guest is editor of IEP Magazine, Individualized Education Perspective, and author of Artistic: The Art of Redefining a Label. LOVE THIS and will show to my son. I usually don’t share my posts on others’ blogs but this SO relates to what you posted and I posted it around the same time…!!!! Full Spectrum Mama, can you email me at theartofautism@gmail.com – I love your blog. Debra Muzikar (I know I have your email someone but can’t find it).